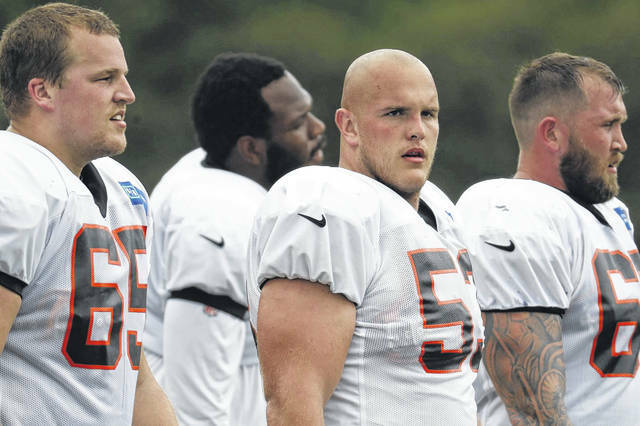 Cincinnati Bengals offensive linemen Billy Price (center), Clint Boling (65) and Christian Westerman (63) observe during a recent practice. Price and Boling are expected to be starters. CINCINNATI — If Cincinnati Bengals offensive line coach Frank Pollack saw anything in the first preseason game that will alter the starting lineup moving forward, he isn’t saying. https://www.limaohio.com/wp-content/uploads/sites/54/2018/08/web1_BillyPrice.jpgCincinnati Bengals offensive linemen Billy Price (center), Clint Boling (65) and Christian Westerman (63) observe during a recent practice. Price and Boling are expected to be starters.